A mix of African daisies, perfect for rockeries, path edges and containers. These plants have a bushy habit, with lots of brightly coloured flowers in shades of orange, cream, yellow and salmon from June/July to October. They grow in large drifts in the Namaqualand areas of Cape Floral Kingdom, making a stunning display on their own and mixed with other African daisies and bulbs. Plants grow to a height of 20-30cm. The flowers attract butterflies. 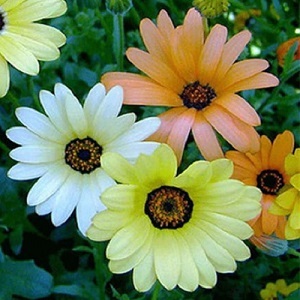 These daisies grow best in full sun and well-drained soil. Flowers open towards the sun. They need moisture to grow when young plants, but become increasingly drought tolerant as the season progresses. Pack of approx 600 seeds. Sow in autumn or spring indoors or directly into the ground or containers in late spring. Sowing instructions and a colour photo are printed on the packet. Conditions Sun and well-drained soil. Sow in spring or autumn indoors into a tray of seed compost. Cover lightly with 1mm of compost and do not exclude light, which is needed for germination. Keep at 18- 21°C and seeds germinate in 1-3 weeks. Transplant seedlings to pots when big enough to handle and then out into the garden after the last frost. Protect autumn sowings in a greenhouse before planting out in spring. Keep young seedlings well watered. Or sow seeds directly into cultivated ground or pots in late spring. Grow Deadhead to prolong flowering. Clear away plants once they have finished flowering in the autumn.